nickel as strengthening agents. The steel has good strength and toughness, hardenability and overheat resistance stability, also high susceptibility of flake formation and temper brittleness. Its poor weldability requires high temperature preheating and stress relieving, before and after process. It should be Hardened and tempered before application. 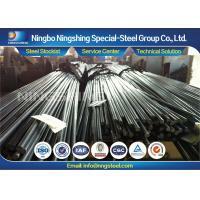 after nitriding and ultrahigh strength steel after low tempering isothermal quenching.